A Historical & Special Collections exhibit exploring student life outside the Harvard Law School classroom. This LibGuide highlights some of the material from the physical exhibit on display in the Law School Library's Caspersen Room from September 2, 2014 to January 8, 2015. Also included are some additional resources and extra materials not featured in the physical exhibit. Over the years, students have found respite from their studies in activities both solitary and social, on campus and off. 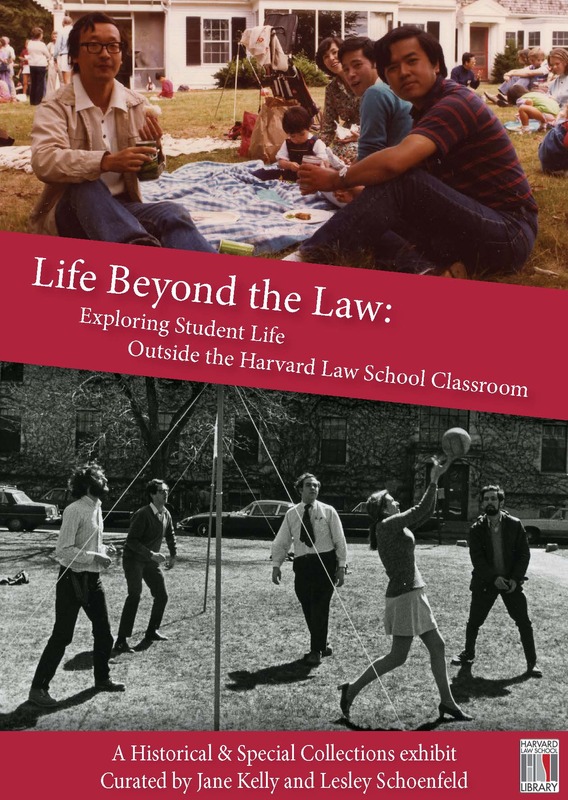 Life Beyond the Law: Exploring Student Life Outside the Harvard Law School Classroom examines the experiences of Harvard Law School students from the mid-1840s to the present. It focuses on life outside the classroom along the themes of off-campus activities, leisure and the arts, and athletics. Largely told in their own words, this exhibit gives a glimpse into the lives of individual students whose experiences are captured in letters to friends and family, personal diaries, student publications, and photographs. Many activities that law students enjoyed in the past, such as visiting local attractions, going to the Harvard-Yale football game, and attending informal events with faculty, remain a part of social life today. Other activities, such as playing games of euchre or whist, have fallen out of favor. As students try to balance life within the “university world” and the “outside world,” their lives become a mix of their work at the law school, interactions with friends and faculty, and the personal interests and hobbies they bring with them to campus. The scope of this exhibit is shaped by the changing demographics of the Law School student body and the materials that have made their way into Historical & Special Collections. It by no means represents every student’s experience. Current and former law students, think about what words and images you would use to describe your experience outside the classroom. How does it compare to what you see here and what would you have included to tell your story? We look to you to provide the material to broaden the story of student life at the Harvard Law School.